As a freelance marketer, you understand the hassle it is to keep track of the endless amount of online accounts. Once you're logged into the correct account, you find yourself with five browser windows open each having an undetermined amount of tabs containing all of your systems of process workflow...everything from MailChimp and HubSpot, to Google Drive, Canva, and Buffer. The list goes on while you end up in a matrix of browser confusion. What if there was a way to reduce the clutter? What if you could run all of these apps within one window where you could switch between all your workspaces instantaneously? What if you could access all of the Google Services (including Google Analytics, Google Adwords, and more), HubSpot, MailChimp, HootSuite, Canva, Facebook Business, Facebook Messenger, and just about every other application you need to do your job? What if you could switch between your client's support Google Docs and your Canva account with one click? The answer is here. You have to try Shift. Say hello to your little friend. This software is absolutely, mind-blowingly, incredible. Shift is all about streamlining your workflow, like a boss. Get your work done across Google Mail, Calendar, and Google Drive. Not to mention the extensions that are available. Once you're set up with this software, you can increase your marketing productivity immediately. You can access Boomerang, Grammarly, Google Services, and just about all of your favorite apps. Plus they have unified search with the pro version, giving you the ability to search all of your apps and mail accounts at the same time. You won't lose any of your extensions, either. If you want to be able to manage multiple accounts with one click, and finally declutter your desktop, Shift is your handsome solution to the mess. Whether you use Windows, Mac, or Linux, say goodbye to ends browser tabs, logging-in-logging-out nightmare. If you're still not convinced, take the tour by watching the video below. Shift 2.0 is Here - Take the Tour! from Shift on Vimeo. Shift is available as a freemium SaaS. 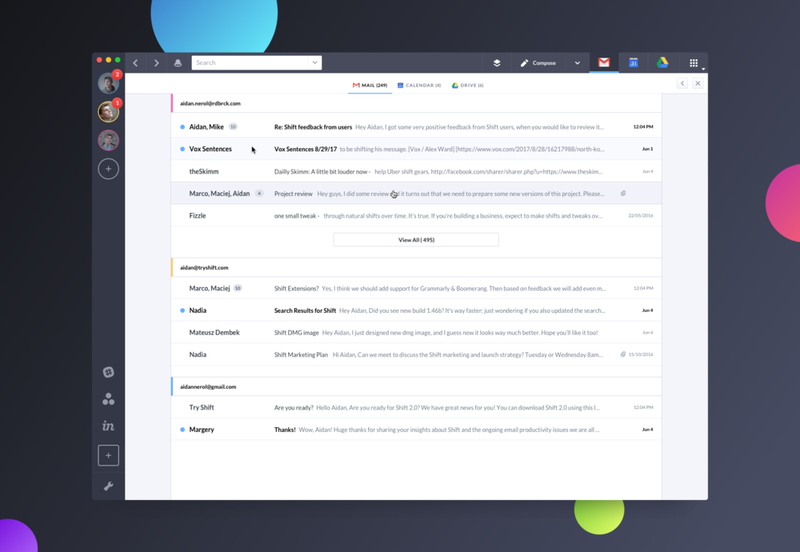 It's great for anyone who lives in many browser windows and tabs, having to be constantly switching between Google and Outlook accounts throughout the day. And although the limited availability of Shift is awesome, the Pro version is definitely worth the upgrade. Try Shift. You won't regret it. Need help managing your marketing workflow?